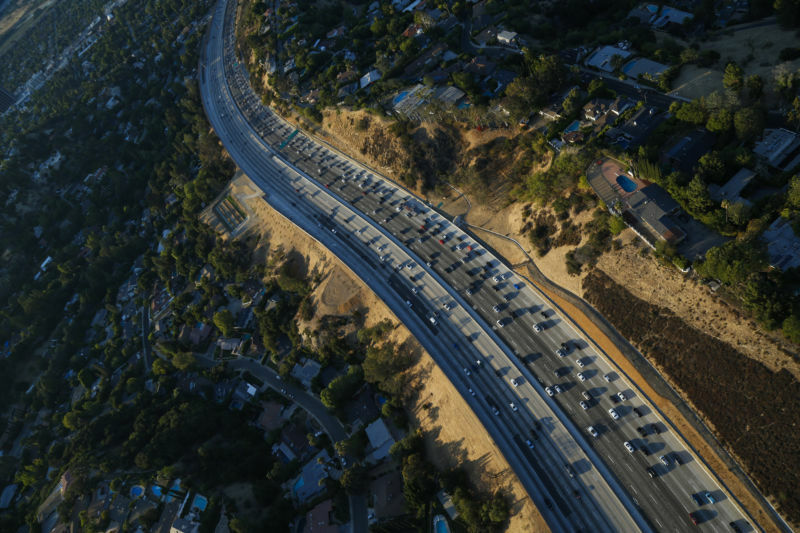 Enlarge/ Cars sit in rush hour traffic on the 405 Freeway through the Sepulveda pass in this aerial photograph taken over Los Angeles, California, US, on Friday, July 10, 2015. Back in August, The Boring Company was already distancing itself from a plan it pitched earlier in the year to build a test tunnel under Sepulveda Boulevard and the 405 freeway in Los Angeles. Musk told the audience in May that the state of California had conditionally exempted The Boring Company from having to obtain a permit under the California Environmental Quality Act (CEQA). If the tunnel was going to be used to shuttle people, then The Boring Company would complete the full CEQA permit, Musk promised. But CEQA permitting can take years, and The Boring Company didn’t have that kind of time. At the same time, two affluent neighborhood groups—the Brentwood Residents Coalition and the Sunset Coalition—sued the City of Los Angeles for seeking to waive the CEQA requirements. Now, The Boring Company intends to focus on the Dugout Loop, for which it has begun the CEQA permitting process (although it’s unclear if a full permit will be acquired before construction starts). Critics have charged that The Boring Company has taken advantage of poorer neighborhoods, like the Hawthorne neighborhood under which Musk’s first tunnel is being completed. Meanwhile, richer neighborhoods represented by the coalition of Westside neighborhoods have the resources to fight back. Others might see the opposition from wealthy LA neighborhoods as a form of NIMBYism that stops innovation from coming to impacted LA transit. For now, Musk’s first Hawthorne tunnel is almost complete. The Boring company intends to open the tunnel to the public in December.